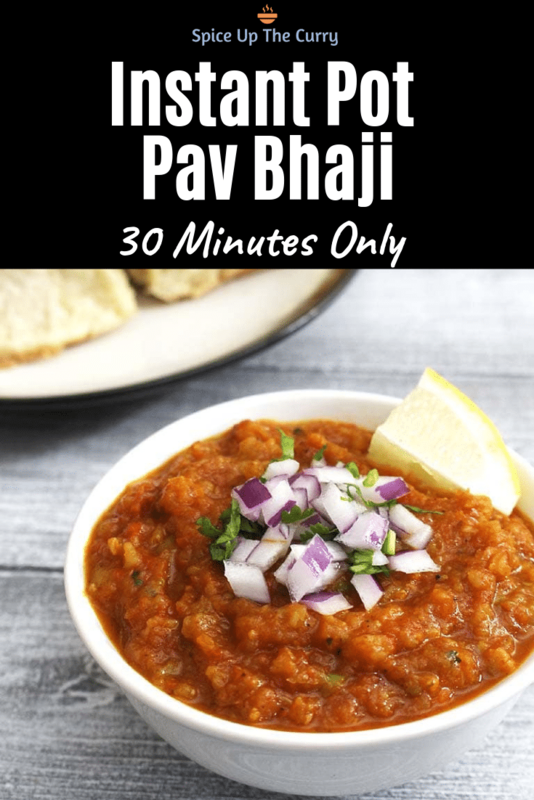 Instant Pot Pav Bhaji Recipe – You need only 30 minutes (from start to finish). I mean from chopping veggies to serving the dish, just takes 30 minutes. Isn’t it cool? You will have delicious, Indian street style Mumbai pav bhaji ready in your electric pressure cooker Instant Pot. Why make pav bhaji in instant pot? The authentic method of making pav bhaji is easy but it is time-consuming. In that veggies are pressure cooked and boiled first. Then we saute onion-tomato in the pan and then mix in boiled, mashed vegetables with masala. For this procedure, you need to keep stirring once in a while, so you have to be there near the stove. But when we make pav bhaji in instant pot, we are doing all the step (sauteing, boiling) in just one go. Easy, right? 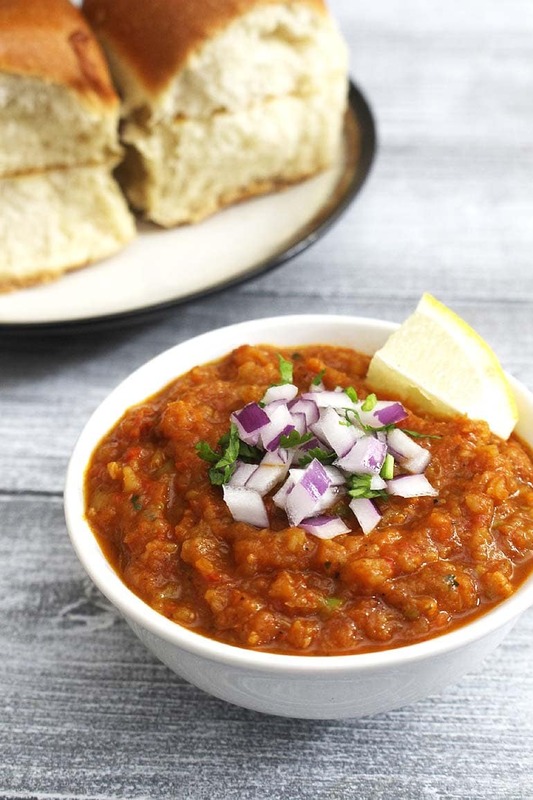 Does instant pot pav bhaji taste the same as an authentic one? Yes, it tastes exactly the same as street vendors sell in India. The bhaji is heavenly delicious, medium spicy and buttery. It tastes even better when served with butter toasted soft pav. I cannot imagine my pav bhaji is made/served without butter. To get the best taste (when we talk about the authentic taste), butter is an essential ingredient. Pav bhaji is cooked in butter and it is topped with a dollop of butter before serving. But if you are health conscious then you can reduce the amount or substitute with oil. Which pav bhaji masala powder to use? Pav bhaji masala is the second essential ingredient here, so it has to be good in quality and taste. 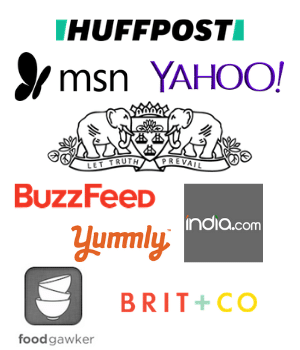 I recommend using the Everest brand. MDH comes after that. I have a really bad experience with Badshah. Or if you have time you can make it at home by following this pav bhaji masala powder recipe. It is important when you add pav bhaji masala. Whenever we are making pav bhaji in instant pot or pressure cooker, always add masala after vegetables are cooked. If added along with vegetables and then it is cooked on high pressure, the masala loses its flavor and aroma. 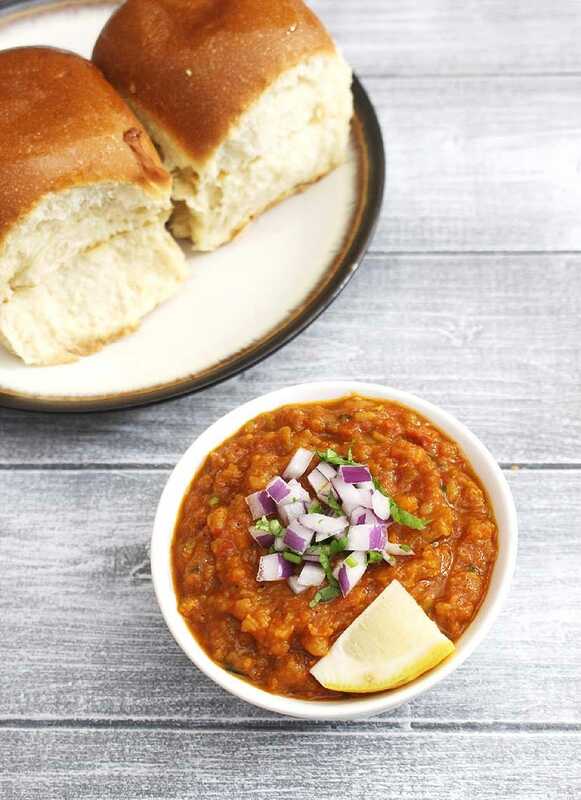 How to make Instant Pot Pav Bhaji? Take roughly chopped onion, bell pepper and garlic in a food processor. NOTE: I was out of green bell pepper, so I have used a red one. For best results please use green pepper. Pulse it to make it finely chopped. Remove it to a bowl. In the same, now add chopped tomatoes. And make a chunky puree. It does not require smooth puree. Keep it aside. Turn on the saute mode in Instant Pot. Once hot add 1 tablespoon of butter in it and let it melt. Add cumin seeds and let them sizzle a bit. Then add onion, pepper mixture. Mix and cook for 3-4 minutes or till the raw smell of onion and garlic goes away, also onion becomes soft. Mix and cook for 3-4 minutes only. Now add all the vegetables (potatoes, peas, cauliflower, carrot). Also, add salt and red chili powder. Cover the IP with lid. Cancel the saute mode by pressing the cancel. And turn on the Manual mode and set it for 6 minutes high pressure. Keep the valve in sealing position. Once done, let NPR (naturally pressure release) for 5 minutes then change the position of the valve and do QPR (quick pressure release). Once the pin drops, open the lid. Add pav bhaji masala and turn on the saute mode. Keep them a little chunky. Do not mash it completely that it becomes pasty. Now add remaining butter and let it melt. Stir well. Lastly, add chopped cilantro and turn off the saute mode. Mix well and instant pot pav bhaji is ready. Now cut the pav horizontally and apply butter on both sides. Heat the pan on medium heat and place the pav on hot pat. Once lightly toasted on the bottom flip them toast the other side similarly. Repeat the same for rest of the pav. Remove the bhaji to a bowl, add a dollop of butter, garnish with chopped onion. Drizzle little lemon juice on it. And serve with a side of toasted pav. Instead of pav, you can use burger buns or dinner rolls. Or simply use any sandwich bread slices. You can use your choice of vegetables. The taste depends on what vegetables you are using. But potato is the base, so do not skip or reduce the amount of potatoes. Play with rest of the vegetables. Few options are zucchini, cabbage, eggplant, green beans, broccoli, sweet corn. To enjoy cheese pav bhaji, remove piping hot bhaji to individual’s serving plate and garnish with grated cheese. To make paneer pav bhaji, add 1 cup of chopped or grated or crumbled paneer at the end. Take onion, garlic and bell pepper into the food processor bowl and pulse them to make it finely chopped. Remove it to a bowl and then puree the tomatoes in it. Keep it aside. Turn on the saute mode in IP and add 1 tablespoons of butter. Once melted and hot add cumin seeds and let them sizzle. Now add onion pepper mixture and saute till onions becomes soft. Then mix in tomato puree and cook for 3-4 minutes. Now mix in all the vegetables, salt, red chili powder and water. Cover the lid, cancel the saute mode and cook on manual high pressure for 6 minutes. Do the NPR for 5 minutes then do QPR. Once pin drops open the lid, add pav bhaji masala and turn back the saute mode again. Mash with potato masher till it is little chunky. Add butter and let it melt, mix. Lastly add chopped cilantro and lemon juice, mix well and turn off the IP. Apply butter on pav and toast both sides in hot pan till they are very lightly golden brown and toasted. Serve bhaji (topped with chopped onion and drizzled lemon juice) with toasted pav. This was DELICIOUS! Thank you for posting it. It brought me back to the streets of Mumbai. Very glad to know that you enjoyed. which instapot should i buy for 2 people ? 3 qut or 6 qut ? So in love with your dishes ! Thank you much for this one !